India has been the best platform for the manufacturers to test their products and at the same time earn a lot. And it is the reason that draws more manufacturers and investors towards India. Now a Noida based company, Ringing Bells have something that is going to drive the Indian gadget lovers crazy. Well, it's a smartphone called, "Freedom 251" and is now out for sale for an unbelievable price of Rs.251. Yes, you heard me right. It really is Rs.251. The device claimed to be India's best affordable smartphone might also be world's cheapest smartphone. Now the device is out for sale and here we are telling everything you should know about the Freedom 251. Well this is the one that should be discussed first. Customers can make the device their own buy paying just Rs.251 plus extra Rs.40, for shipping. A smartphone with a lot of features at this price? Well you have to go for it. After all it's just Rs.251. Just as its tagline says "dreams will be full filled". We don't really know how the company is going to actually earn from it. Just stay tuned. Talking about its features, the Freedom 251 comes with 4 inches of qHD display. But we can just say it has a display that will help you to see what's going on your smartphone. After all when we look at the price the "display" is satisfying. Say CHEESE, because the Freedom 251 comes with dual shooters. On the rear is of 3.2 megapixels and VGA one at the front. Just like the display, we can't complain about the camera quality and all. Just pay the 250 and go home. The device is powered by Qualcomm processor clocked at 1.3GZh and is quad core. The device also boats 1GB of RAM and this will be the main reason for a certain number of customers to buy this. Coming to the connectivity, the device features like Bluetooth, calling, SMS and well, it is a 3G device. Sounds cool, huh? This will also be the world's cheapest 3G smartphone. The device comes with an onboard storage capacity of 8GB and you can expand it by microSD card. The device is featured with a 1450 mAh battery and with all these, low performing, features the device should be alive for one whole day. The device comes preloaded with a bunch of Govt Apps like Women Safety, Swach Bharath, Fisherman, Farmer, Medical and other popular apps like Whatsapp, Facebook, YouTube etc. What if I say the company provides warranty for the device? Well it is TRUE. The device comes with 1 year manufacturing warranty and you even have 3 months warranty for the headset that you will get along with the device. The device is an "available only in India" one and is a bad news for the rest. A tweet from BJP MP Kirit Somaiya says that the device does not have BIS certification. He asks clarification for marketing the device without BIS certification and also asked UP Govt to check Bonafide of Company. We hope this all will be done when the device finally arrives at your door step. The freedom251.com site that is open now is facing frequent crashes due to heavy traffic and it simply means the website is not that secure. We don't really know how secure your credentials are that you enter in the site. 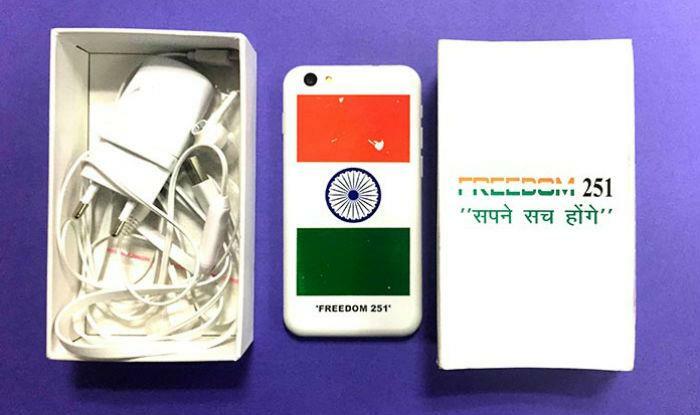 For the promotion of the device, the company sent out a few units to various technology journalists for review and what they found out was the device looked alike from the pictures given on freedom251.com. It is said that the Freedom 251 is actually a Chinese rebranded device, specifically an Adcom device. The units that the reviewers got had the brand name Adcom made hidden by whitener. Freedom 251 is a 4 inch qHD device with 1.3GHz processor, 1 GB RAM, 8GB storage and dual shooters which is available at a ridiculous price tag of Rs.251. We have also seen these features a bit more detail above. If you have your Rs.251+40 ready, then head on to freedom251.com and book one. The company says the device will be sent out for delivery by June 2016. The courage that the company shown by releasing a device like this is outstanding. From the traffic on the website it is clear that everybody is interested on the device and all are waiting for the sweet June to come so that their "sapna honge sach". Let's wait for some time more, to know whether its real or not! Technology is expanding rapidly across the globe and so, is the field of mobile technology. Smartphones have come a long way in the past few years. Amidst the competition in the technology sector, we at Tekno AVR are expecting the launch of our glass free Naked Eye 3d Smartphone in India within a short period of time. Today people are spending a lot of time with the new technology and thus, we felt the need of adding a spark to their interest by introducing the elegantly built holographic display 3D smartphone. By introducing the naked eye 3D smartphone or the Holographic Display smartphone in India, Tekno AVR is about to bring a revolution in the technology sector of the nation.